The Larson Electronics EPP-20A Explosion Proof Plug is a watertight plug and is rated for Class 1, Division 1 and 2 and Class 2, Division 1 and 2 and is suitable for use in areas where coal dust and petrochemical vapors may be present. The EPP-20A explosion proof plug is rated at 20 amps and along with our EPP-15A series plug is compatible with our EPO-20A explosion proof 20 amp outlet. This plug can only be used in T style outlets and in order to retain explosion proof safety it must be mated to an explosion proof outlet. This plug is designed to lock into compatible receptacles by twisting the plug body until an audible click is heard, which indicates the plug is securely connected. Once locked into place this plug will not accidentally pull out. This plug is ideal for applications where moisture and corrosion is a problem and well suited for use in marine and manufacturing environments. This This explosion proof plug features non sparking aluminum construction, longer housing for easy handling, specially designed brass pins for secure full length pin contact and 15 amp current rating. Inter-Compatibility: These plugs will fit non-explosion proof standard receptacles (NEMA 5-15R, 5-20R, or 6-20R). These plugs will work with Course Hind ENR Dead Front Interlocked receptacles. 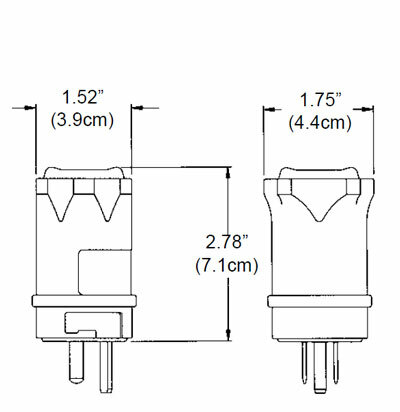 These plugs are are cross-interchangeable with Crouse Hind™ENP5201 and Hubble Killark UGP-20231-UGP-20232 ACCEPTOR® plugs. Due to possible manufacturer changes we cannot guarantee interchangability although we have made every effort to ensure cross compatibility correctness. Suggested Applications: Manufacturing, Industrial, Warehouse, Lighting, Motor-Generator Sets, Compressors, Wet areas or Locations Where Petrochemical Vapors are Present.